The Peerless Power of Comics! 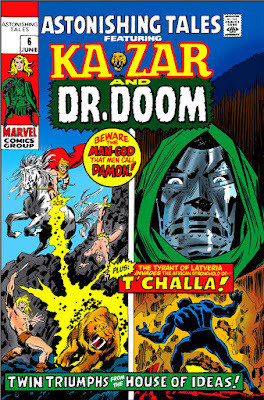 : Gene Colan's Dr. Doom: King vs. King! Gene Colan's Dr. Doom: King vs. King! 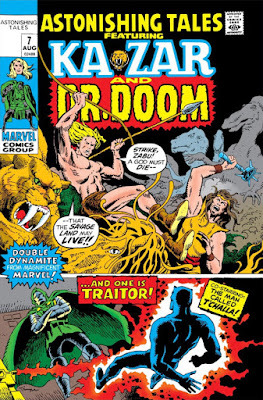 Having previously taken a look at artist Gene Colan's early work with the Master of the Mystic Arts, Doctor Strange, it seems only fitting that we sample the other end of the spectrum and bring together a collection of his work featuring the Master of Menace, Doctor Doom, a character that Colan lent his distinctive touch to in stories from the late 1960s to the early '70s. In order to build a fleet of rockets constructed with Vibranium so that they will never go off course, Doom "interrogates" (which is putting it mildly) an African native who finally breaks and reveals where to find the ore: the nation of Wakanda, where Doom sends a sophisticated scanning device to map the deposits' exact coordinates. To reach Wakanda and mine the Vibranium, Doom boards his nuclear-powered Excavator and tunnels all the way to Africa. Once in position, the ship's mining activities begin causing massive surface damage to Wakanda, enough to warrant an emergency message to Avengers Mansion where it's received by you-know-who. 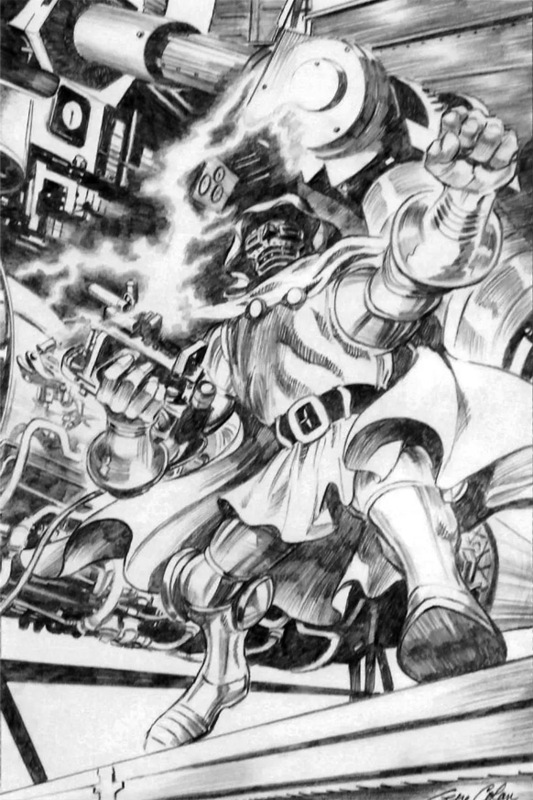 While Doom is conducting repairs on a mechanism from the Excavator, he sets aside his weapon, which is retrieved to use against him. We know the culprit isn't a jungle cat--but it is someone dressed like one. And not only does the Panther make his entrance, but so does Mr. Colan. Another first-time Marvel moment here is that this would be Gerry Conway's first scripting of Doom, an assignment he would excel at with the character's future appearances in other titles. He certainly takes on a plum assignment here: While both men are rulers, T'Challa and Doom are two very different people with different notions on what truly makes one a king and what perceived weaknesses are considered strengths, just the sort of potential friction between two strong-willed individuals that Conway often turns into compelling reading. 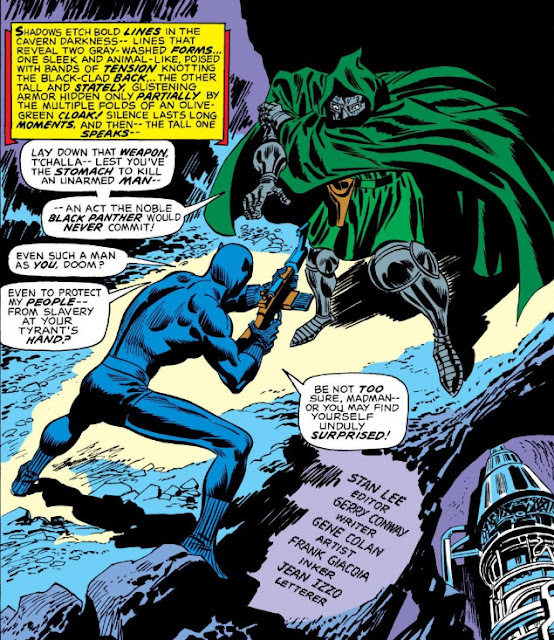 Unfortunately, one weakness that T'Challa exhibits almost immediately is underestimating Doom, in addition to demonstrating an almost shocking level of naiveté in regard to accepting Doom's statement that he is unarmed--when in fact Doom's armor has any number of weapons ready to deploy at a moment's notice. Colan has a limited page count to work with in this segment of the issue allotted to Doom, but he lays out a fine story with what he's given--condensed without looking condensed, something that marred these Astonishing Doom stories at times. For example: Despite Doom's feigned disinterest in T'Challa's status as Wakanda's king, Colan carves out a small slice of the ongoing story to give Doom an opportunity to further reflect on the man he's holding, however perfunctory. The conclusion Doom reaches doesn't really elicit surprise, since Doom would be the first to tell you of the sacrifices that he's made and the forces he has overcome to turn both himself and Latveria into a power known and feared throughout the world. Doom's hasty-gathered intelligence on Wakanda obviously could stand to have a more robust dossier in his database, given the blanket assertions he's made regarding both its people and its assets beyond Vibranium. (One example being his failure to identify the technological advancements housed in the nation's "hidden jungle" complex.) His future encounters with both the Panther and Wakanda would serve as an indication that he's done just that. 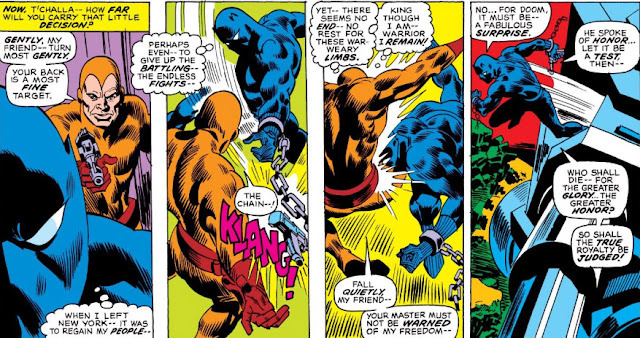 Whether it's his musings regarding T'Challa that prompts Doom to seek him out in order to take his temperature on his thoughts regarding his captor, one couldn't say; but the exchange that Conway arranges between them turns out to be one of the high points of the story. Neither is willing to concede or yield the high ground in their impressions of the other--though we'd have to award the trophy for Best Parting Shot to Doom. While T'Challa has been a captive, Doom's Excavator has caused widespread quakes and casualties throughout Wakanda with its relentless drilling deeper into the Earth in order to expose more of the Vibranium deposits. Doom, for his part, is even more driven than usual (and that's saying something), having to cease excavating several times in order to attend to crucial repairs of components on his ship, which results in a steady rise in tension among members of his crew that has unfortunate results--for them. 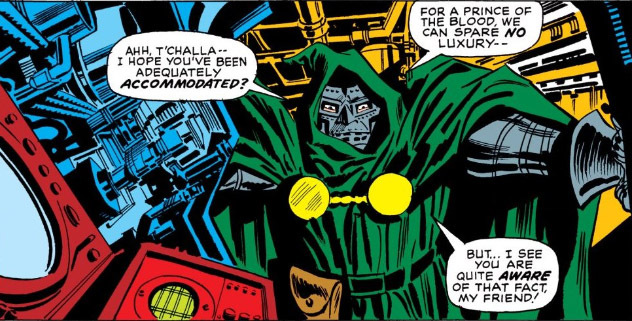 The decision that we'll find T'Challa has reached in how to deal with Doom could arguably be viewed as out of character for him, particularly if it's mainly meant to be a gauge as to which of them has the more valid claim on royalty. 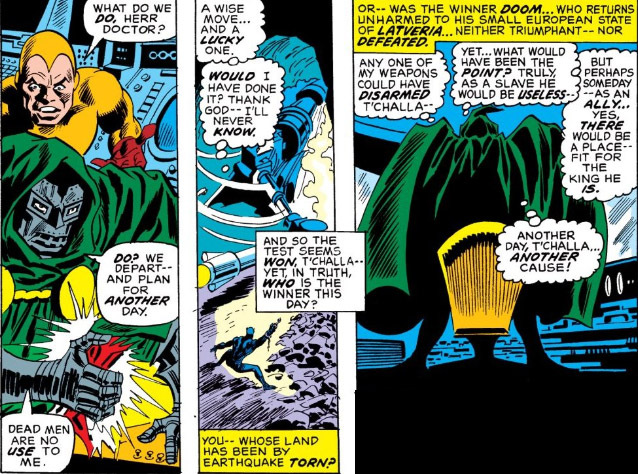 As an Avenger, and as a head of state who presumably has his own intelligence data on potentially hostile nations, T'Challa should already be well aware of Doom's ruthlessness, which makes the course of action he takes appear less well-considered than it might have been. At any rate, we could all argue at this point that decimating your own country and its entire population isn't a viable option when dealing with a despot. It's disappointing to learn that T'Challa's bold move could have easily been countered by Doom, had he wished it. 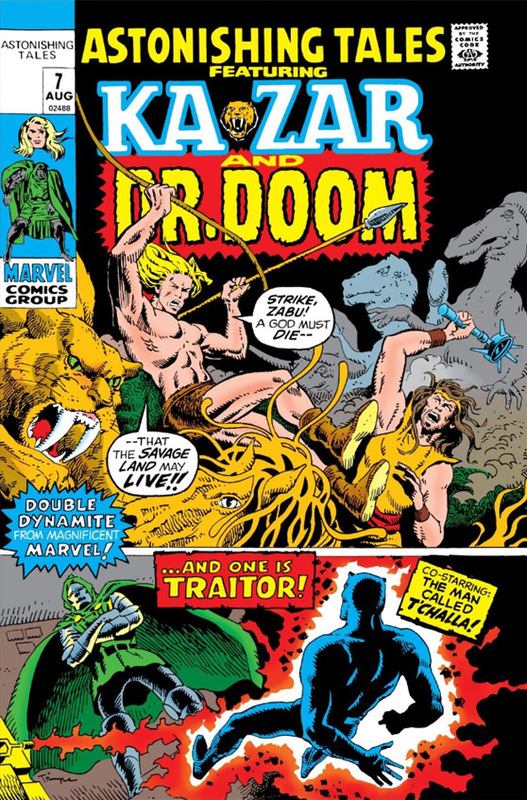 For one thing, it robs T'Challa of having any possibility of meeting Doom on equal footing since, in the end, he really did have no way of stopping this man from ravaging his kingdom; in addition, it throws into doubt his ability to rule his people and act in their best interests, in light of a ploy that would have failed had Doom simply changed his mind. How will he explain such an act of desperation to his people--gambling with their lives and those of their families as he did? And what of Doom? "What would have been the point" of disarming T'Challa, Doctor? Well, it would have meant that you'd have been able to fill your ship's coffers with Vibranium without interference, which is the reason you've done all of this. After all, your invasive drilling operation has left Wakanda in virtual ruin--why hesitate now? Why should you hinge your decision to continue on enslaving the Wakandans? You have more than enough manpower and technology at your disposal to secure the Vibranium, or anything else you'd care to do, without conquering the Wakandan nation (or what's left of it). All of that said: For a story to be this involved and number at only ten pages is a credit to both writer and artist--a good start with the character for Conway, and just a day at the office for Colan, as he continues his fairly new partnership with one of Marvel's most intriguing characters. Part 2 of the PPC's Colan/Doom spotlight, as it turns toward... the Sub-Mariner! (Looks like we've caught him in the middle of excavating! A great story, illustrating Doom as a morally complex character, and therefore a lot more interesting. And Gene the Dean's moody artwork is a perfect choice. Ran across these issues of Astonishing Tales in an old hippie used bookstore in the '80's. They made for some good readin'. They were part of a huge cache of used Marvel mags going for a quarter a pop. And me at sixteen with a couple weeks wages in my pocket and no bills. It was one of those once-in-a-lifetime scores, the fabled motherlode. I may have cried when I stumbled upon them. Fortune shone her light on little M.P. 's head that day. At The Will Of Doom! The Recycled Vengeance Of The Destroyer! Gene Colan's Dr. Doom: The Living Prison! "And Men Shall Call Him... Warlock!"